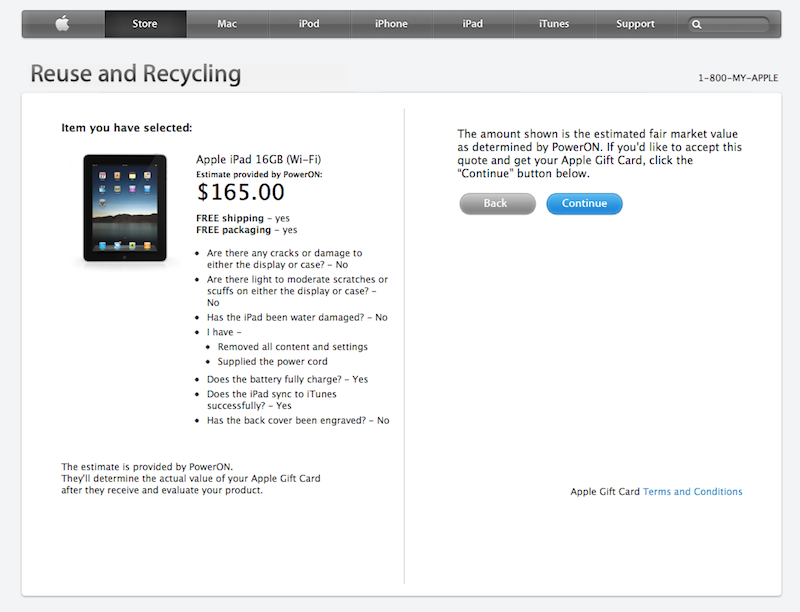 Apple has enhanced its recycling program to add a new "reuse" option that pays owners of existing iPhones, iPads, Mac or PC desktop or notebook computers a fair market value for their old equipment, paid via an Apple Gift Card. Apple continues to offer a variety of recycling programs: a place to dump unwanted electronics of any kind at its Cupertino, California head quarters (which it has operated since 2002); free recycling of Mac batteries at any of its retail stores; and free pickup and disposal of any brand of computer or display contracted through WeRecycle!, which user can obtain a free prepaid shipping label from at www.werecycle.com. Now, users who own an iOS device or a computer from any manufacturer can obtain a credit for the fair market value of that device, calculated by PowerOn, a third party company Apple contract with to run the reuse program. While recycling old products dismantles them and harvests valuable components such as metal, plastic and glass for recycled use in new products, reuse is an even greener option, as it extends the useful life of products that have value in the second hand market. "If your product qualifies for reuse  meaning it has monetary value  youll receive an Apple Gift Card equivalent to its fair market value as determined by PowerON," Apple states on its new recycling program website. "You can use the gift card for eligible purchases at any U.S. Apple Retail Store or the U.S. Apple Online Store. If your product does not have monetary value, well recycle it at no cost to you." Users can get a preliminary valuation for their old devices online, then arrange to ship them to PowerOn at no cost. The company will then contact the user if the apprised value is different than what was quoted online, a figure based on the user's own description of the product's condition. If the user chooses not to accept the final value, it will be returned at no charge. Otherwise, PowerOn will arrange to credit the user via an Apple Gift Card within three weeks of receipt. The company also securely erases all data remaining on the devices while preparing them for resale. PowerOn's estimated value of a functional, first generation iPad in very good condition is $165, for example. Users may likely be able to find their own second hand buyer for relatively new products in good condition, and fetch a higher price. However, for older devices with some damage or dysfunctional features, the reuse option may provide an easier, more convenient option that still recoups some value they can then reinvest in new Apple gear.